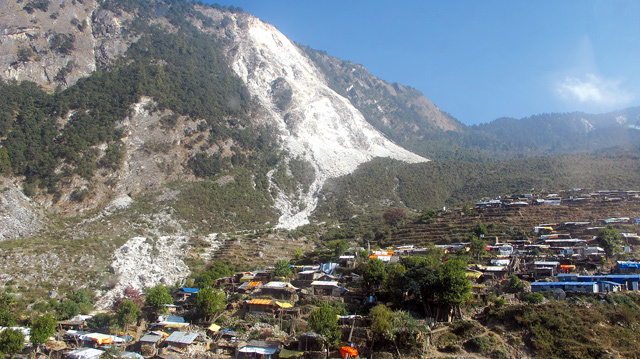 DOUBLE DISASTER: After the 25 April 2015 earthquake devastated Kerauja village, situated 10 km from the epicentre in Upper Gorkha, it was hit by a rockfall. It is now on a government list needing urgent relocation. Bipana Lama (below) had just turned 18, and was preparing for her wedding with 27-year-old Tok Lama when the earthquake struck central Nepal on 25 April 2015. Their homes in Golche village of Sindhupalchok near the Chinese border were destroyed, but the couple went ahead with the wedding in a temporary hut in a shelter in Selang village. Like 2,600 other families in central Nepal, the Lamas don’t just have to rebuild their homes. They have to relocate the entire neighbourhood to a safer area because Golche is in danger of being buried by falling boulders. 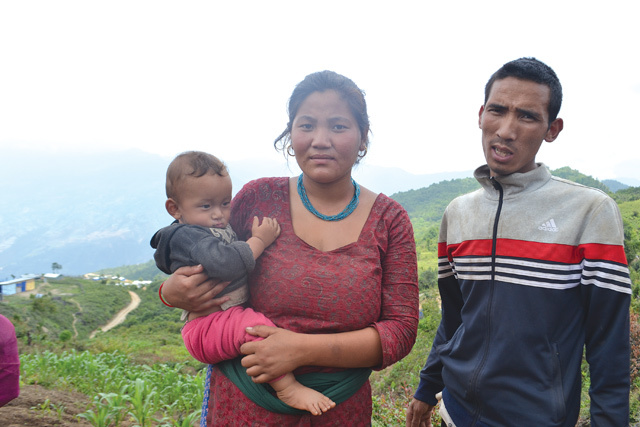 Bipana Lama, with her husband and baby (left) waited two years in a shelter for the government's resettlement plan in Selang, Sindhupalchok. Bipana gave birth last rainy season, but three monsoons later the family is still in a camp for survivors in Selang, waiting for the government to relocate them. “We miss our village, but we can’t go back because there are still rocks falling off the cliff. No one lives there now, only ghosts,” says Bipana. Many of the bodies buried in the slides were never recovered. Sixty-four families, mostly Tamang, moved down to Selang, and will join 250 other relocated households in an integrated settlement planned here by the National Reconstruction Authority (NRA) and Oxfam in Nepal. 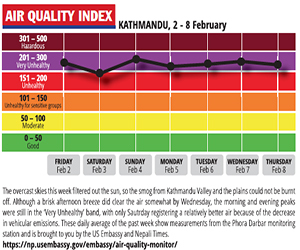 The NRA has identified five villages, one each in Sindhupalchok, Rasuwa, Dolakha, Gorkha and Ramechhap districts, which are uninhabitable because of the danger of landslides. It is in the process of acquiring land before the end of this monsoon, and says it will begin constructing road, water and electricity infrastructure soon afterwards. Nearly 700 families in the five districts will be relocated in this first phase. The NRA plans to finish the first phase of relocation in two years, but that will cover only a quarter of families living on slopes destabilised by two massive earthquakes in 2015. In 15 affected districts, the NRA and the Department of Mines and Geology (DMG) have identified 2,629 households that need to be either protected from rockfalls or relocated. Whole settlements, not just a few houses, need to be relocated in 60 of the 136 places identified by the NRA as being vulnerable (see map). The NRA is covering some big settlements in the first phase itself, but many other villages will have to live through the danger for a few more monsoons. Relocation also means dislocation. Most families have an emotional attachment to home villages where their ancestors lived for generations. Moving to a new place also means losing livelihoods and starting life all over again. “We understand these sensibilities, and this is why we are not forcing anyone, but their lives will always be at risk if they do not relocate to safer places,” said Pokharel during a trip this week to Selang, where earthquake-displaced families are desperately waiting for the NRA to begin resettlement. Tanka Bikram Silwal, a 45-year-old cardamom farmer, lives in a temporary shed near his earthquake-damaged home, two hours walk from Selang. Most of his neighbours have abandoned their houses because of falling rocks, but Silwal is staying on because he has to take care of his farm. 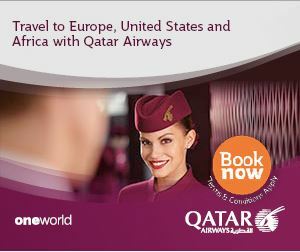 “Income is good here, how will I feed my family if I go away? This is where I have spent my entire life. But if everyone leaves, I will also have to go,” he says.